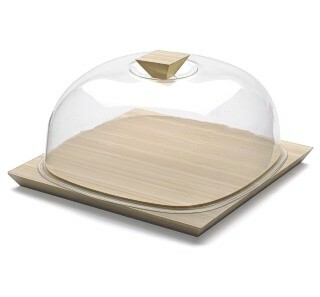 Striking and unusual, the design of this cheese dome adds a contemporary feel to an otherwise traditional product. The base is made from solid natural side compressed bamboo with a wholly natural waterbase finish. Exclusive non slip rubber feet give the board it's stability while the striking feature of this product is its square base and similar plexiglass lid. Veering away from the traditional round dome shape, a rectilinear theme is carried through from base to top including the inverted pyramid shaped handle. The complete dome measures 30 by 30 cm (11¾ approx.) and about 20 cm high (8 inches), it is also refrigerator safe.